These rubber balls are designed to bounce in an erratic fashion. Durable rubber ball keeps the game interesting and challenging for your dog. 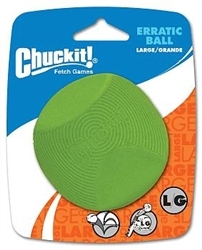 Grippable rubber ball is made just the right size to use with your Chuckit!® Ball Launcher, sold separately.